1. Don't expect them to always do the right thing. This is the greatest way we set ourselves up for failure. People won't always do the right thing. They won't always make the right call. Sometimes they don't have your interests at heart. Sometimes they simply make mistakes. 2. Don't expect them to agree with you. People, especially your true friends, won't agree with you just for the sake of agreeing with you. If they have a differing opinion, they'll debate you for sure. 3. Don't expect them to be mind readers. It's an enormous mistake to assume that people, your friends, your family, your partner, to be able to read your mind. 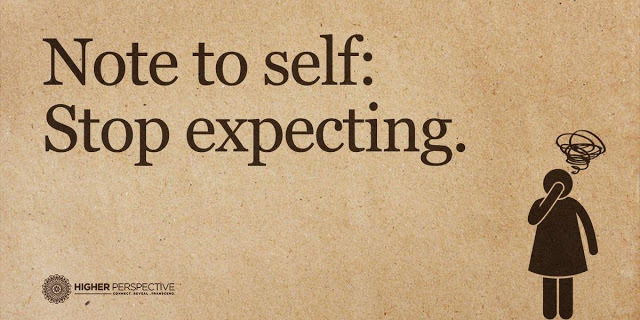 If you have expectations, you need to make them clear. They can't read your mind. 4. Don't expect them to understand you. You should be yourself because you want to be, not because you want to impress anyone else. No one has to like or understand you. Instead, you should focus on liking and understanding yourself. 5. Don't expect them to always stay the same. People change over time. One of the greatest mistakes you can make is assuming that they're going to remain exactly as they were a year, 5 years, or 15 years ago. If you constantly bring up the past and assume old behaviors will continue, you'll push them away. 6. Don't expect them to always have it all together. We all struggle in life from time to time. Don't expect people to always have their lives together. There were probably times where you didn't, and it's great to have the support of other people to grow as an individual. 7. Don't expect them to follow the golden rule. But you still always should.